Soaps are mixtures of sodium or potassium salts of fatty acids which can be derived from oils or fats by reacting them with an alkali (such as sodium or potassium hydroxide) at 80°–100 °C in a process known as saponification. Click on the left mouse button and rotate the soap structure. Notice that one end of the molecules is made up of a hydrocarbon chain -- the other end is a very polar structure containing oxygen and sodium. Soap molecules have both properties of non-polar and polar at opposite ends of the molecule. Nearly all compounds fall into one of two categories: hydrophilic ('water-loving') and hydrophobic ('water-hating'). Water and anything that will mix with water are hydrophilic. Oil and anything that will mix with oil are hydrophobic. When water and oil are mixed they separate. Hydrophilic and hydrophobic compounds just don't mix. The cleansing action of soap is determined by its polar and non-polar structures in conjunction with an application of solubility principles. The long hydrocarbon chain is non-polar and hydrophobic (repelled by water). The "salt" end of the soap molecule is ionic and hydrophilic (water soluble). When grease or oil (non-polar hydrocarbons) are mixed with a soap- water solution, the soap molecules work as a bridge between polar water molecules and non-polar oil molecules. Since soap molecules have both properties of non-polar and polar molecules the soap can act as an emulsifier. An emulsifier is capable of dispersing one liquid into another immiscible liquid. This means that while oil (which attracts dirt) doesn't naturally mix with water, soap can suspend oil/dirt in such a way that it can be removed. The soap will form micelles (see below) and trap the fats within the micelle. Since the micelle is soluble in water, it can easily be washed away. 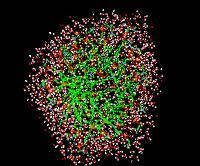 When you mix soap into the water the soap molecules arrange themselves into tiny clusters (called 'micelles'). The water-loving (hydrophilic) part of the soap molecules points outwards, forming the outer surface of the micelle. The oil-loving (hydrophobic) parts group together on the inside, where they don't come into contact with the water at all. Micelles can trap fats in the center. Micelle (above) shown with water molecules.